Erythritol belongs to a group of compounds that are not sugar and not alcohol. The molecules are like hybrids of a carbohydrate and an alcohol (without any ethanol … what gets you drunk). They can be found in natural foods like fruits. The way these molecules are structured gives them the ability to stimulate the sweet taste receptors on our tongues. Erythritol gets absorbed into the bloodstream and is excreted unchanged in the urine. 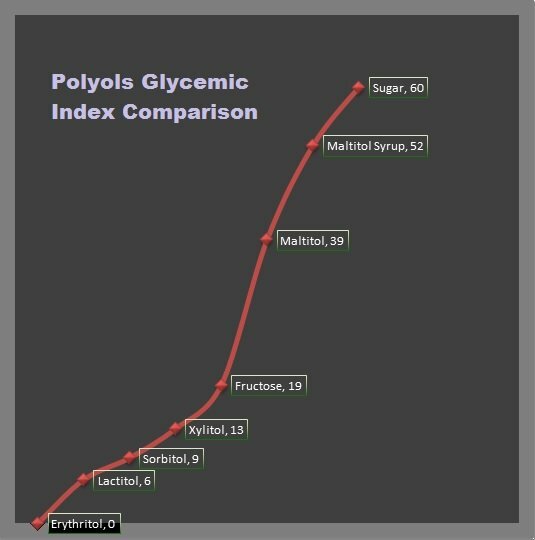 When healthy people are given erythritol, there is no change in blood sugar or insulin levels. There is also no effect on cholesterol, triglycerides or other biomarkers.